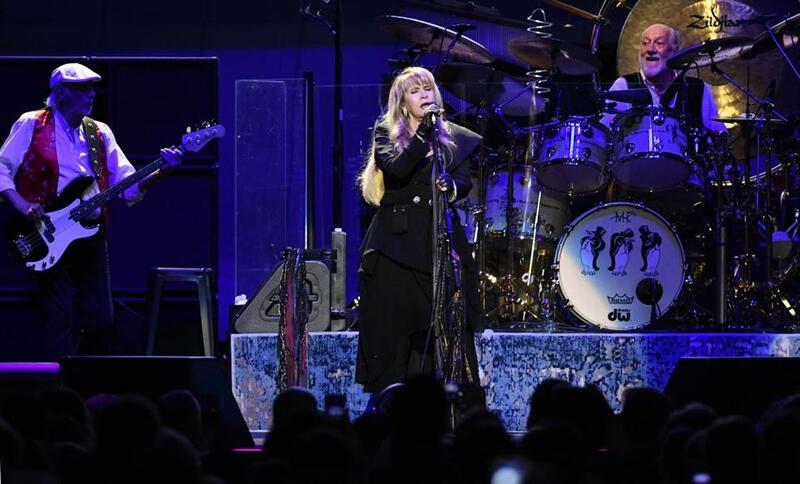 From left, John McVie, Stevie Nicks, and Mick Fleetwood of Fleetwood Mac performed Sunday at TD Garden. If there’s one thing there’s no room for in Fleetwood Mac, it’s hard feelings. How could there be, given that its members were writing breakup songs to their bandmates and love songs to people other than the bandmates they were married to? So even though Lindsey Buckingham unamicably skedaddled last year, it’d be foolish to wager against his eventual return. But on Sunday, the first of two nights at TD Garden (the band returns on Tuesday), Fleetwood Mac proved that it could do just fine without him. Meanwhile, the band could’ve done a whole lot worse than recruit Neil Finn and Mike Campbell to fill Buckingham’s shoes. The Crowded House kingpin brought frontman charisma and a knowing ease with sharp songwriting, and the Tom Petty sideman brought unflashy yet potent guitar heroics. During McVie’s 15-year hiatus, Fleetwood Mac largely bypassed her songs entirely, but there was no such preciousness surrounding Buckingham material with the current lineup. Finn was loose-limbed and frisky on “Second Hand News” and dug into “Go Your Own Way,” while Campbell took on guitar workout “Oh Well,” which Buckingham had after all appropriated from founding member Peter Green. Green was the focus of another song reassignment, as Nicks — with retrospectively obvious inevitability — sang “Black Magic Woman” in the first person, Campbell tore into a screaming, bluesy solo, and McVie took over on electric piano before the two traded licks. And each of the new recruits was afforded a spotlight on their previous lives, Finn with a lovely stripped-down “Don’t Dream It’s Over” (eventually joined by Nicks) and Campbell with a shimmering and dreamy “Free Fallin’” buoyed by a slideshow that made everyone sad about Petty once again. Both songs, whether by intention or circumstance, touched on a theme rippling through the concert: the passage of time, and how much and how little it’s affected Fleetwood Mac. When Nicks sang “Landslide,” it was simultaneously in the voice of both the 26-year-old woman who wrote it and the 70-year-old she would become. And the night ended with Finn and McVie sharing the lead on “Don’t Stop,” thinking about tomorrow in whatever form Fleetwood Mac would take. Marc Hirsh can be reached at officialmarc@gmail.com and on Twitter @spacecitymarc.